A great big THANK YOU to all the families that came out last Saturday to help with our Community Work Day! Wood was split into firewood, trees and shrubs were trimmed back, classrooms were dusted and cleaned and the whole campus feels great. 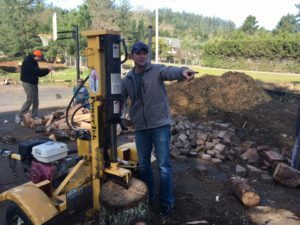 We have a special thank you for Nicholas Wright, a parent in Redwood class, who was able to get us a hydraulic log splitter for free…and we’re STILL using it! While it was unfortunate that we needed to cut down a large number of the trees on the north side of the property, we are making the most of it by producing a LOT of firewood. 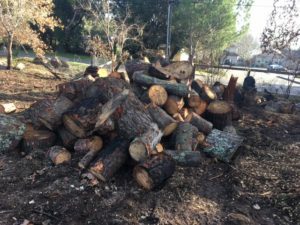 The entire BCMS community is welcome to take as much of the green firewood as they want, as well as any of the wood chips that was produced in the tree removal. We would also welcome any volunteers who would like to help finish up the job of splitting up the logs…see me for details. Another special thank you to Steve Bogerri for many projects he’s been helping the school with, including rebuilding the entrance awning for Eucalyptus classroom! While we are waiting for a few more donations to come in, we are incredibly grateful to those who were able to donate funds to help with relief from the October fires. These funds will be distributed to the affected families of BCMS before the holiday break. We will continue to distribute funds as we receive them. Again, thank you all for helping in this endeavor. Sonoma (and Brush Creek!) Strong! On a final note, many of our families may not know that the property that the school sits on is owned by an LLC that is made up of current teachers of the school. 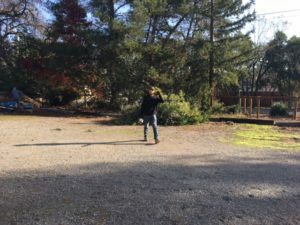 In consultation with the Board of Directors, the LLC members, with the help of Peter Young (alumni and Sequoia parent), have been working on an expansion and improvement of the facilities here at BCMS. Updated exteriors, improved interior features, and two new classroom buildings are all on the docket in the coming months. We look forward to sharing our progress on these plans right after the winter break. We know our families will be just as excited as we are when we unveil the vision of Brush Creek Montessori as we move in to 2018 and beyond. We are hopeful that the New Year will bring a lot of welcome growth for our children, our school, and our community. Happy New Year!